Screenshot of a web page showing where you should click. I’d like to suggest some more about promoting walking, cycling, and transit, but I doubt these ideas will be taken seriously unless I show up to the next open forum. Open forums will be held March 25 and April 15 to seek input from students, faculty and staff regarding UND Parking and Transportation planning and possible changes. All are welcome. Following is some background information about the proposed changes. Please note that final decisions on parking and transportation have not yet been made. More information will be provided when it is available. Why are parking and transportation changes being considered? UND Parking must become self-supporting within the next five years, and will no longer receive state funds beginning in 2024. All costs and expenses related to parking must be covered through permit sales and parking fees. Members of the Parking Committee have been meeting regularly to develop a new plan for parking. The forums will gather input from students, faculty and staff. Parking recommendations will be finalized in May and sent to Vice President for Finance & Operations Jed Shivers for review. After review, the new parking structure will begin operating Aug. 1. Parking revolves around three factors: cost, convenience and supply. Everyone would like parking to be convenient, inexpensive and sufficient, but that’s not possible. If parking is inexpensive and convenient, it will not be sufficient. 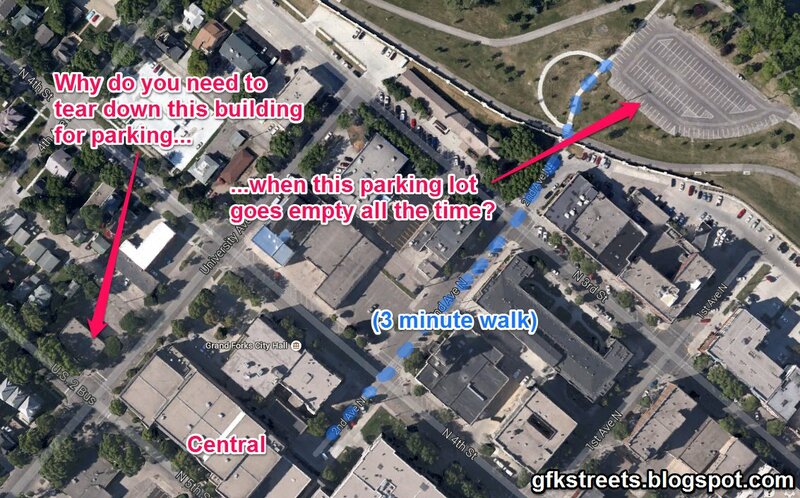 If there is sufficient and inexpensive parking, it will not be convenient. And if there is sufficient and convenient parking, it will be expensive. Parking fees will likely be raised to cover parking costs. Instead of zones, parking may be “tiered,” or have different costs according to location. And parking spaces may be shared. For example, 100 people can generally share 60 to 80 spaces, since not everyone is on campus at the same time. Parking fees may differ by location and use. Shuttle bus services may offer additional routes to transport people from more distant lots. Those lots will have lower parking rates. Shuttle bus services may also be adjusted. No final decision has been made. If the recommendations are approved, they will go into effect on Aug. 1. 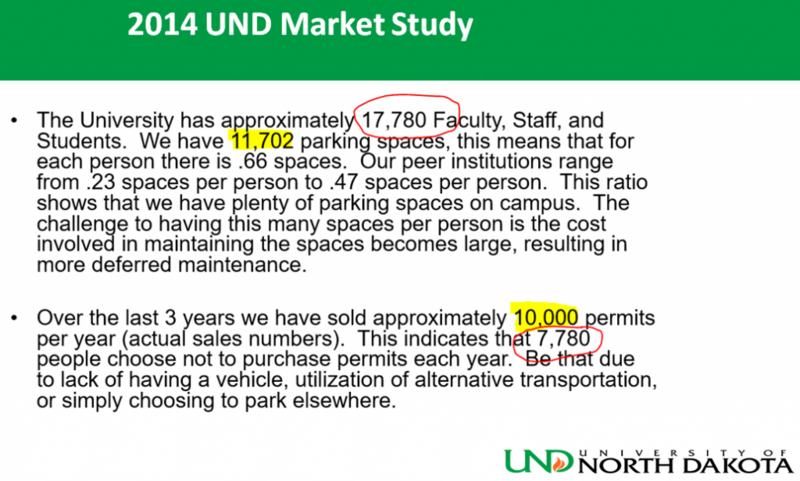 UND Parking – A Bit of Hope? 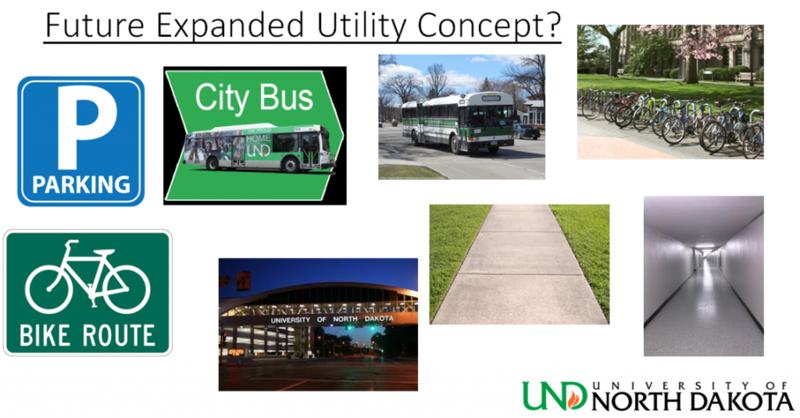 Author mattPosted on April 13, 2018 April 13, 2018 Tags grand forks, parking, streets, university of north dakotaLeave a comment on UND Parking – A Bit of Hope? The city of East Grand Forks, MN is divided on whether to add parking. “Add parking,” you say, “why wouldn’t you want to add parking?” In this case, as reported by the Grand Forks Herald, the additional parking lot would add 32 stalls on the river side of the Boardwalk, a popular downtown collection of restaurants and bars. The problem is that the river side of the existing parking lot (as shown in the image below) is the Greenway, a park/wilderness area created as a buffer from the Red River after the devastating 1997 flood. Map centered on proposed parking lot site. The mayor said he supports the plan to add parking. He said it is the best thing for the city and he would vote for it with his tiebreaking vote if the city council was deadlocked. Mayor Stauss said his support for the plan is not influenced by his brother and son owning the Boardwalk building. Some owners, however, are seeing the long-term consequences. Additional parking is available across DeMers Avenue in the Cabela’s parking lot, in other lots and streets near downtown, and across the Red River in downtown Grand Forks, ND. Why another lot, and why here?